In 1966-7 my Dad got a job as a young reporter for the Daily Mail’s Manchester office, just as it was made Newspaper of the Year. All staff received the memo below from editor Mike Randall. I couldn’t agree more – and it’s certainly how I’d hope people expect writers to behave. I’d add though that in the 15 years I’ve been writing, I haven’t noticed nearly as much awareness of the dangers of libel, sensationalism and indiscretion in young journos as was drilled into [my generation of] pre-internet trainees. I don’t think Twitter and the pressure of instant comment helps much though. 1. No member of the staff intrudes or is called to intrude into private lives where no public interest is involved. 2. No ordinary member of the public is lured, coerced or in any way pressed by a Daily Mail representative into giving an interview or picture which he is clearly unwilling to give. 3. It remains our duty at all times to expose the fraud and reveal the mountebank wherever public interest is involved. 4. In the reporting of Divorce Cases we use our own and not the Judge’s discretion. We give details only where the case and the summing up are of valid legal or public interest. We do not at at any time carry reports which merely hold either party up to ridicule or reveal aspects of their private lives which cannot be any concern of the public. 5. No member of the Daily Mail invents quotes or uses subterfuge to obtain quotes. 6. We are not in business to suppress news. Where anybody is guilty of withholding information that ought to be made public we use every legitimate method to give our readers that information. 7. Daily Mail staff do not allow themselves to be used as vehicles for the promotion of publicity stunts which have no legitimate news value. 8. Anyone who works for the Daily Mail should be watchdog of ours standards and a person who commands public respect. This entry was posted in Uncategorized and tagged art, arts, current-events, daily mail, ethics, fraud, internet trainees, journalism, mail staff, media, memorandum, mike randall, mountebank, occupy-wall-street, politics, publicity stunts, reporting, sensation, subterfuge, writing. Bookmark the permalink. So The Mail was a proper paper when it took Hitler’s side? They were also never questioned on Chapter 10 of Nick Davies’ book, ‘Flat Earth News’, the guiding text for Leveson. Chapter 10 is titled, ‘Mail Aggression’. Why were they never questioned on its contents? Was proud to have known and been friends with Mike Randall, he was one of those people you read about and wish existed, a sort of Bill Nighy State of Play character. I never felt that any time spent with him was enough.He was rightfully proud of this statement and of standing up against cheque-book journalism. A witty, beautiful man whom I miss more than I can say. Thanks for posting this. Thanks Ben – good of you to say. Been a while since any boss has explicitly guided on things like this – interesting how the definition of ‘the story’ has changed, journalism used to be a noble profession and now you may as well work at Foxtons! 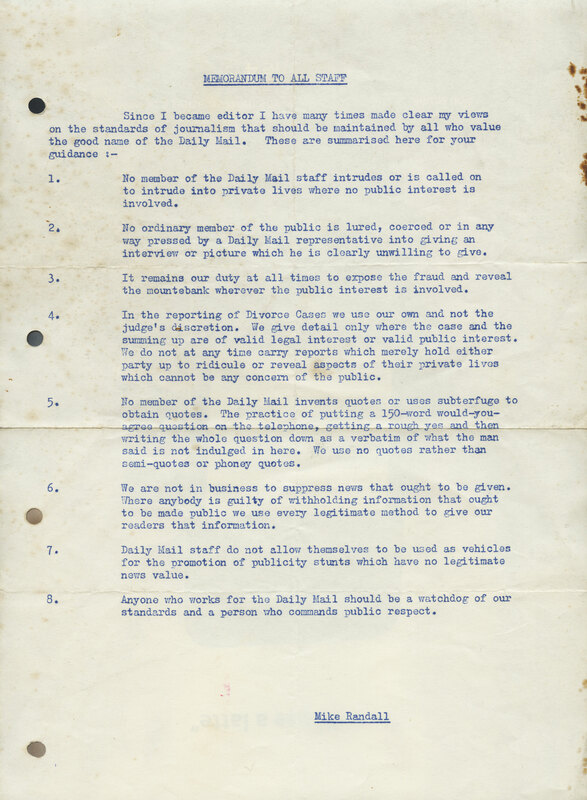 This is a terrific memo from the former Daily Mail editor Mike Randall to his staff in the 1960s, setting out its standards and values. It is posted by the son of one of the reporters who worked at the paper at the time. No intrusion into private lives, no forced interviews or pictures and upholder or heroic standards. My, how the high and mighty have fallen. It is a shame that these guidelines aren’t being adhered to today. Great to see this. Sentiments such as these should be hammered into every journo’s subconcious. The company that I work for makes all employees read and signup to a basic set of “Business Conduct Guidlines” annually. Keeps us clean. As you know from our Twitter exchange, I have also repeated this, hoping it was your intention it ought to be widely seen. My version is at http://www.francesalut.com/2013/10/what-every-reporter-should-still-be-told.html and links back to here. I do not share the very sweeping anti-press emotions of the present time, as my own piece about this code of conduct indicates. But then I’m a reporter, albeit not a tabloid one – though I have, as a freelance in recent times, contributed occasional items to tabloids. However, I see nothing in that code of conduct that I would not happily observe myself and commend to colleagues in all sections of the media, not merely newspapers (some of the worst intrusion I have witnessed has been by camera crews). This is a great find. Every writer should keep a copy of this. Fascinating! And still relevant today. Thank you so much for posting this. Before the lapdog media existed as the monopoly it does now. Looks like they left out the “No media giant will consolidate all news organizations into one and churn out trashy content thus killing journalism” clause. I think that this is a great post on ethical standards and procedures to take in action to get the most important things in life. I am sharing your thoughts and feelings of course now on my blog. I hope you don’t mind. If only those standards were still applied…great post! A glimpse of time when the newspaper people did the right job and not what is done today. It is good that you reminded us of the old days. I think that once one of the tabloids started the slippery slope into unpleasant intrusive journalism they all started to follow suit. Living this code should be at the heart of journalism. Does anyone have a distribution list for all in NUJ to send it to? “Expose the fraud and reveal the mountebank.” Love. Would like to refer folks to my own boss’s TEDTalk, which gives a little context on why foreign news coverage has gone so substantially in the United States. http://www.ted.com/talks/alisa_miller_shares_the_news_about_the_news. We can lament a decline in ethics till the cows come home, but understanding the economics behind sensationalism and gossip is important as well. Still, good journalism is possible, it still happens, and I’m proud to be working for an organization that makes it so. Thanks for sharing this. Reminds me of being pestered by a Daily Mail journalist six years ago for a quote (when I worked at a health charity) about a young child with a particular health condition. He even provided an unsolicited picture of the child! As the family had benefited from the charity’s support, I gave an uplifting quote saying that with the right support and treatment the child would have a fulfilling life. This was the opposite of what the journailst wanted – it didn’t fit with his doom and gloom vision of how awful the child’s life would be – so unsurprisingly he didn’t use the quote. I was actually relieved not to be quoted in the paper. In a week where a UK jury are deliberating on the actions of some members of the press, I share this is a very timely reminder of how far standards have fallen, in my lifetime. Thanks to Dysonology for the original post. Reblogged. What a timely reminder with the jury being out on the hacking trial. Reblogged at writingcompulsion.wordpress.com and I truly enjoyed this post! Thanks for sharing this invaluable piece of journalism history! How are the mighty fallen. Glad to have seen this, though. Gives me some hope for the future that such standards did once exist, even if I think they are unlikely to exist in the Daily Mail again. Pingback: As Mark Driscoll resigned, no one mentioned of ethical concerns | lit!